We talked recently about what to do to have you breakthrough, and soon afterwards a friend contacted me about a hang up he’s having. Essentially, he’s been in action towards achieving his goals, but his emotions have been all over the place. I share this with you, since even though we were talking about him breaking in as an actor, everything I said to him will apply to most anyone, going after most anything. I’ve got some bad news, and some good news for you: The bad news is, this one meeting is *probably* not going to be the big break that launches your career. It may be, sure; but far more likely it will be another brick in the path. Don’t look at it as your one big hope, or you’ll feel like a fool if nothing major comes out of it. If you look at it as a chance to meet some people, get your feet wet in the industry, and hopefully learn some things, then you’ll go home happy no matter what. And, a little more bad news: It is HARD to break in. 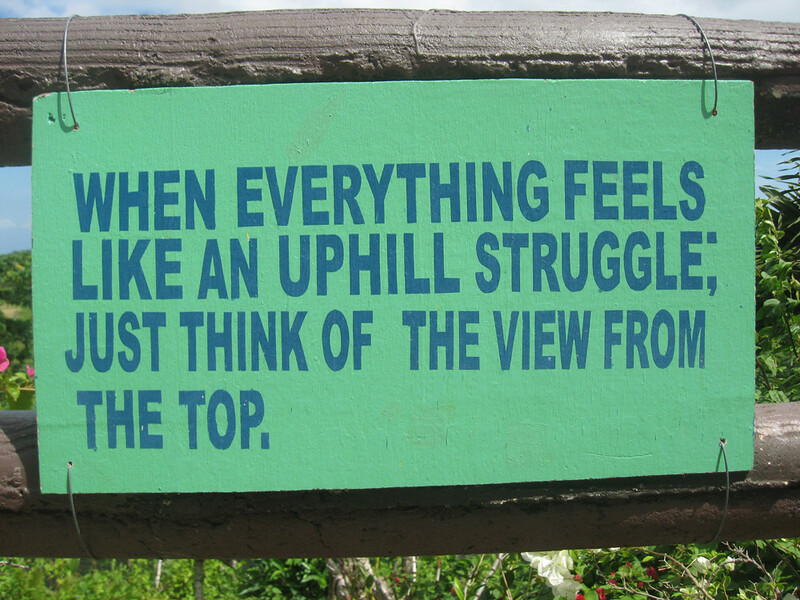 It’s hard to pick yourself up every time you get knocked down, and keep climbing that hill. And the truth is, the vast, vast, *vast* majority of people who try to break in won’t make it. BUT, they won’t make it because they don’t do what it takes, not because the opportunities don’t exist. So if you truly decide in your heart to set out down this path, understand that it’s a long uphill journey. The GOOD news, however, is it CAN be done. It’s true that people are breaking down every single day out here, but they’re also breaking *through* every day. You have all the tools necessary to make it. It’s good that you’re feeling some fear, that means you understand that this thing is REAL! All you have to do is stay clear on what you want and why you want it, make a plan and stick with it. If you stay in motion, victory is guaranteed; it may take a week, it may take a year, it may take 10, but it WILL arrive. I can tell you for sure though, there’s a certain peace that comes with knowing you’ve done your best, no matter what else happens. Plenty of other people will question you, and try to convince you to stay in your shell. And yes, they mean well; but the truth is, deep down you moving up takes away their excuses. The harder you struggle and the higher you climb, the more obvious it becomes that they are standing still. So they’ll try to pull you down, rather than pull themselves up. Never forget that an object at rest tends to stay at rest. One more thing: Love, peace, and happiness come from inside of you, not outside. You won’t find them in a career, a home, and definitely not in another person. You bring them with you wherever you go. Doing work you’re passionate about makes it EASIER to feel these things, yes. And the right relationship makes it possible to do more than you ever thought possible (but there’s no bigger anchor than being involved with the wrong person). Just remember that your job is to be clear on what you want, WHY you want it, and to do something towards its attainment *every single day*. Enjoy the process because it IS a process, and I think you’ll find that as you move more into alignment with your bliss, the Universe will open up to you. And yes, you’ll have some down days. You won’t always feel your absolute best; no one does. But rainy days on set in Hawaii are a lot easier to deal with than rainy days working at a coffee shop somewhere miserable!